It is a one-sentence guide for your readers to what you will prove in your research paper. It is an opinion statement for which you will present supporting evidence. It is a clear expression of YOUR viewpoint, which must be a claim that a reasonable person might dispute. It is the most important sentence in your paper! How do I create a thesis statement? Choose an issue you'd like to explore. Read, read, read about your topic! Whatever you do, don't skip this step! It will not only save you time, but it will also prevent disaster later on. Brainstorm your ideas about the topic. Write a few questions you might want to answer in your research paper. Compose a few complete sentences that answer the questions. because - states the strongest evidence that SUPPORTS your opinion. Even though uniforms offer little freedom of self-expression, nevertheless, high schools should require uniforms because they minimize fashion distractions that can interfere with learning and they are less expensive. Even though uniforms are economical and minimize fashion distractions, nevertheless, high schools should not require uniforms because individual choice in dress helps students learn the values of freedom and responsibility. Even though victims' families might like to have revenge, nevertheless, capital punishment should be abolished because life in prison without parole is less expensive and makes the criminal face his guilt longer. Even though it doesn't deter other criminals, nevertheless, we need capital punishment because each execution makes it certain that one murderer will not kill again. How do I know if I have a good thesis statement? 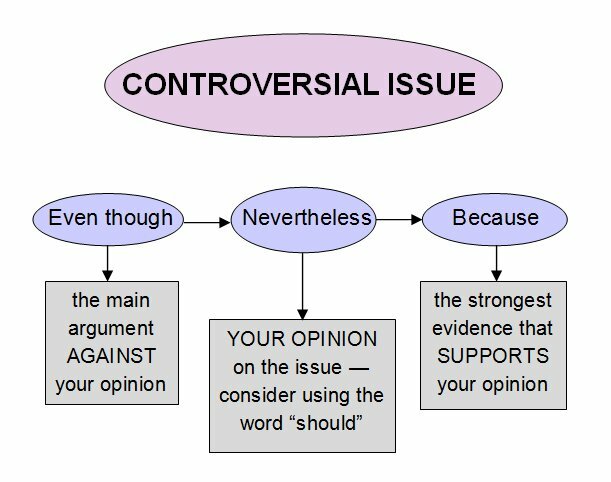 Your thesis statement should take a stand on a specific issue and address one main idea. A reasonable person would not respond "So what?" or "Who cares?" or “Everybody knows that!” to your thesis statement. Typically, your thesis statement appears at the end of the first paragraph of your research paper. Don’t use the first person (i.e., I think, or, my opinion). Support your opinion with the facts you find in your research. Anticipate the opposition and address the other side. As you learn more through your research, you may reach a different conclusion than you expected. If so, it’s okay to revise your thesis statement! After you create your best thesis statement, use the BUILD AN OUTLINE link to get a blueprint for exactly how to write YOUR research paper. Thesis Builder just might be your key to research paper success! Here's a little brochure containing all the information on this page that prints double-sided on one sheet of 8-1/2 x 11" paper.